The second of eight collaborations between actor James Stewart and director Anthony Mann, Bend of the River (1952) is perhaps the most conventional of their five Westerns together, but it's an outstanding film nonetheless. Winchester ‘73 and, later, Bend of the River, also forever altered Hollywood's star system. A then-struggling Universal rejected Stewart's $200,000 asking price (a deal that also included Harvey) so Stewart's agent, MCA's Lew Wasserman, brokered a deal whereby Stewart would instead receive a percentage of the profits, as well as retain cast and director approval. He ended up making a record-setting $600,000 on Winchester ‘73, and around $750,000 for Bend of the River. Soon after the Civil War, former Kansas-Missouri border raider Glyn McLyntock (Stewart) has joined a wagon train of settlers bound for Oregon, becoming an invaluable scout, they unaware of his disreputable past. Checking the trail ahead, he encounters a lynching, Glyn rescuing accused horse thief Cole (Arthur Kennedy) from being hanged. Cole, himself a former (but, in contrast to Glyn, unrepentant) border raider, joins the wagon train just as it's attacked by a small band of Shoshone Indians, during which beautiful Laura Baile (Julie Adams) is arrowed in the shoulder. Glyn and Cole kill the Indians, but Laura's father and de facto wagon train leader, Jeremy Baile (Jay C. Flippen), doesn't trust Cole despite his indispensable help, believing bad man can never change, a rotten apple that must be discarded lest the entire barrel rot. The wagon train arrives in Portland, where from Tom Hendricks (Howard Petrie) they order food and supplies that will see the settlers through the long, harsh winter, the supplies to be sent upriver the first week of September. While in Portland both Laura and her younger sister, Marjie (Lori Nelson), find themselves attracted to suave gambler Trey Wilson (Rock Hudson). Laura, still recovering from her arrow wound, is forced to stay in Portland while she recovers, and Cole also elects to stay in the sleepy frontier town. Months pass, and by October the settlement is running out of food with no word on the overdue shipment of supplies, nor of Laura's condition. Concerned, Glyn and Jeremy ride back to Portland, only to find the city overrun with rowdy miners following a gold strike. Their supplies sit idly on the dock, and Glyn pays several unsavory men (including characters played by Harry Morgan, Royal Dano, and Jack Lambert) to load them onto Captain Mello's (Chubby Johnson) steamship. At the local gambling hall, he's surprised to find a recovered Laura working as a cashier, and now in a relationship with Cole. Glyn confronts Hendricks, who refuses to release the supplies, as they can command ten times the money he originally sold them for. A shootout ensues, with Glyn, Cole, Trey, and Laura fleeing with the loaded ship, and both Hendricks and a nearby gold mining camp determined to steal back supplies literally worth their weight in gold. With a significant portion of the picture shot on location around Mt. Hood, Sandy River, and Timberline, Oregon, Bend of the River is a handsome production, filmed on the kind of grand, Technicolor scale that made the dying B-Western form look cheaper than ever. Borden Chase's screenplay may be a trifle more conventional than the other Mann-Stewart Westerns, but it's one chockful of suspense and action. I've probably seen it eight or nine times through the years and it's still awfully exciting, from the early, still-shocking moment beautiful Julie Adams takes a Shoshone arrow. The main source of dramatic conflict, Glyn's friendship with Cole, is handled with great subtlety. As marvelously played by Arthur Kennedy, Cole is roguishly breezy and likeable, but always with Glyn's awareness that he might turn on him at any moment. The remorseful and reformed Glyn doesn't try to turn his former comrade into a passive homesteader, but hopes through some kind of osmosis, exposed to sincere, goodhearted types like Jeremy, Cole might follow Glyn's path of reformation. Cole, however, is cynical about his chances: once, he insists, Jeremy learns about their past, even Glyn will find himself ostracized by the judgmental, intolerant settlers. The neurosis one usually associates with the Mann-Stewart Westerns thus is effectively split razor's edge between Glyn and Cole, and both actors are up to the thin line that separates them. Chase's script does a fine job fleshing out memorable supporting parts, all well cast. Chubby Johnson was a utility player in movies (and, later, TV) cast in Edgar Buchannan-type parts, sometimes uncredited even after his choice role in a major release like Bend of the River. Here his steamboat captain shares a particularly memorable scene with Jay C. Flippen, after successfully fleeing the first leg of their escape from Hendricks and his posse. Jeremy is grateful for the enormous risk Captain Mello has taken, but the old-timer shrugs it off, saying he used to do stuff like that all the time along the Mississippi, and that he's happy to help folks as nice as Jeremy. It's a throwaway bit, a short breather from all the action before and after it, but the delicate writing makes it unforgettable. Likewise, Mann's direction is intelligent and maximizes the suspense throughout, particularly the startling shootout at Hendrick's gambling saloon, and the good mix of location and soundstage cutting in a climatic fight in the Snake River. I haven't seen the 2017 German import, but based on reviews Kino's new Blu-ray seems to source the same high-def transfer. Bend of the River was shot in three-strip Technicolor, but unlike many recent Blu-ray releases of movies shot in that format, does not appear to have gone back to the original black-and-white separations for this transfer. Rather, an imperfect comp negative combing the three matrices has been used, which results in strong blues but less vibrant flesh tones and reds, which look a bit washed out and even a little brownish. The alignment of the three components is generally fine but occasionally slightly off. The image comes alive in tight close-ups, but Mann uses those vary sparingly, while wider angles, particularly those on location under sunny skies, come off a bit less than they might. The DTS-HD Master Audio (mono) is fine on this Region "A" disc. Supplements are limited to a trailer for this and other Kino-distributed Westerns, along with an audio commentary by Toby Roan. It's good but leisurely, not as densely packed as one might find with, for example, one of Tom Weaver's tracks for Universal's sci-fi and horror titles from the same era, especially considering the production files for Bend of the River are readily available to researchers. Still, it's useful for what it is. 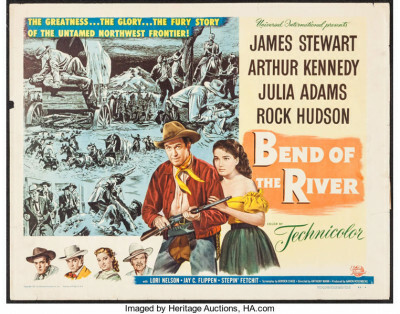 Not the best of the Anthony Mann-James Stewart collaborations, but still awfully strong and still most entertaining, Bend of the River is Highly Recommended.